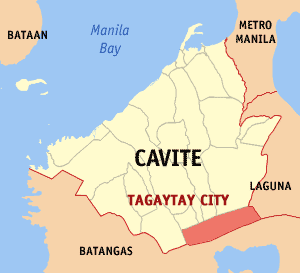 Tagaytay City is located in the Province of Cavite, island of Luzon. It is approximately 56 kilometers south of Manila, with a total land area of 6,500 hectares, which represents about 5.14% of the total land area of Cavite. It lies within 120o 56’ latitude and 14o 16’ longitude and overlooks Manila Bay on the north, Taal Volcano and Taal Lake on the south and Laguna de Bay on the east. The city is linked by the national highway to the Metropolitan Manila Area and to the Province of Batangas. It is also connected by roads to the adjoining municipalities of Amadeo, Mendez, Indang, Silang and Alfonso in Cavite towards the northwest, to the municipalities of Calamba and Sta. Rosa in Laguna in the northeast and to the town of Talisay in Batangas in the south. As per 2015 PSA report, the city's total population is 71,181 and the city's household population is 16,095. Since Tagaytay is a major tourist destination, population doubles on weekends and holidays due to influx of tourists and visitors. The recent population reports shows the annual growth rate of 2.79% from the 2010 NSO census with total of 62,030.